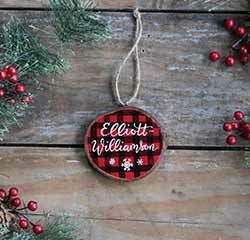 Cabin & Lodge themed Christmas Ornaments - skiing, fishing, bears, moose, deer, hunting, and more! 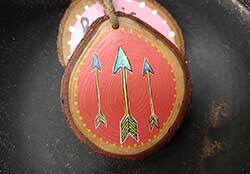 Add a tribal look to your tree with this arrows wood slice ornament! 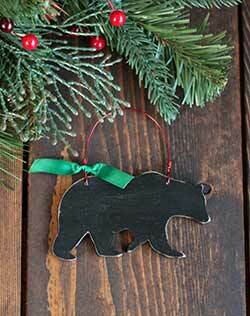 Great for a lodge look or for a hunter, this hand painted black bear ornament comes with free personalization! Boot with Fur Trim Ornament, by the Abbott Collection. 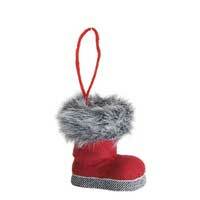 Red santa boot with grey fur trimming. Measures 3 inches long. 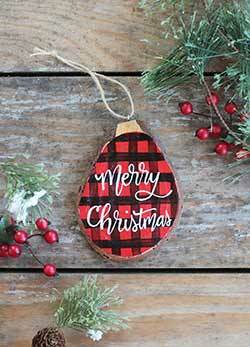 Give a personalized gift with rustic charm with this wood slice ornament, featuring hand painted buffalo plaid, and custom lettered with your chosen text! Glass Pinecone with Green Flocking, by Ragon House. 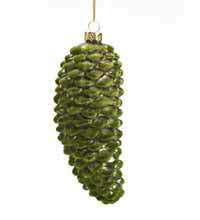 Beautiful olivey green glass pinecone ornament tipped with velvety green flocking. Measures 5 inches long. Lime Green Pinecone Onion Ornament, by K & K Interiors. Matte lime green glass onion-shaped ornament with raised pinecone designs. Measures 4.5 x 4 inches. Glass. 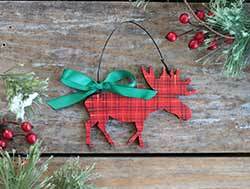 Moose Felt Ornament, by Tag. Part of the Chalet Collection. 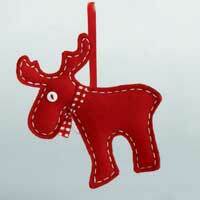 This is for the MOOSE ornament, made of red felt, lightly stuffed, and stitched with white thread. Measures 5.25 x 5 inches. Other ornaments available! 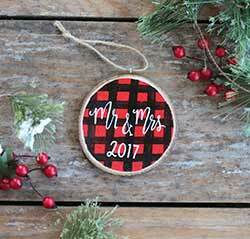 Great for rustic, country, or farmhouse style holiday decor, this hand lettered "Mr. & Mrs." wood slice ornament comes with free personalization. 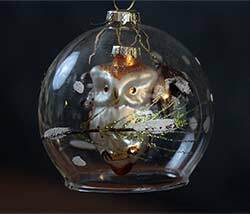 Beautiful glass woodland owl and pinecones ornament inside a clear glass dome. Dome is accented with painted/glittered pine sprigs. 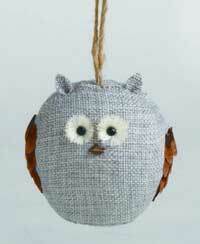 Owl Ornament, by One Hundred 80 Degrees. 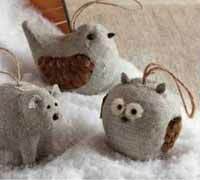 Sold individually - choose the Left, Middle, or Right Ornament. Measures approx 7 inches. Made of natural materials on styrofoam base. Photo courtesy of One Hundred 80 Degrees. 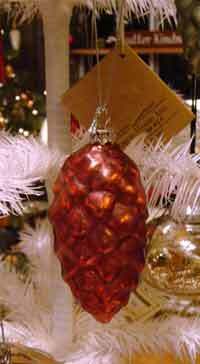 Pinecone Mercury Glass Ornament, by Ragon House. This is for the COPPER ornament. Can be an ornament in a window or on a feather tree, or display in a bowl or on a shelf! 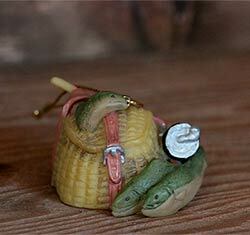 Measures 3.5 inches tall. 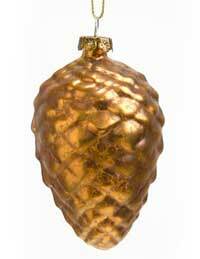 Pinecone Mercury Glass Ornament, by Ragon House. This is for the RED ornament. 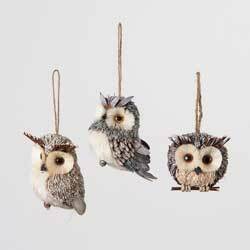 Can be an ornament in a window or on a feather tree, or display in a bowl or on a shelf! Measures 3.5 inches long. 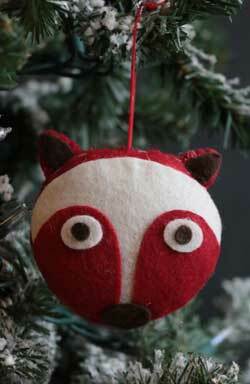 Darling sewn felt pillow ornament in the shape of a woodland animal! In a red, white, and grey/brown color palette. 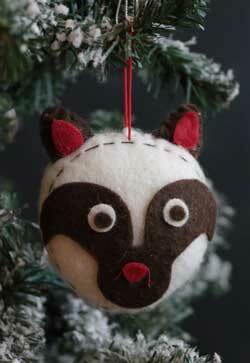 This is for the RACCOON ornament. 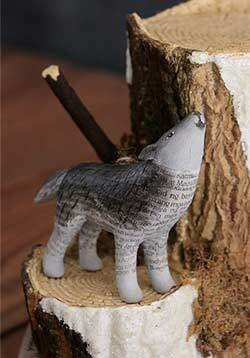 Recycled Paper Animal Ornament, by One Hundred 80 Degrees. Animal ornament made of resin and painted recycled paper. They all measure slightly different, but are on average about 4 inches. This is for the Brown Bear. Other animals also available! 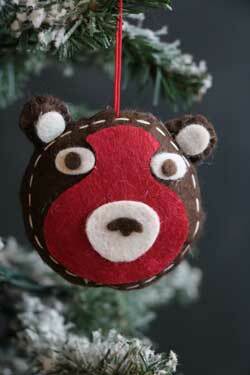 Recycled Paper Animal Ornament, by One Hundred 80 Degrees. Animal ornament made of resin and painted recycled paper. They all measure slightly different, but are on average about 4 inches. This is for the Deer, which still has it's spots!. Other animals also available! 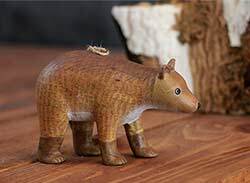 Recycled Paper Animal Ornament, by One Hundred 80 Degrees. Animal ornament made of resin and painted recycled paper. They all measure slightly different, but are on average about 4 inches. This is for the Ram. Other animals also available! 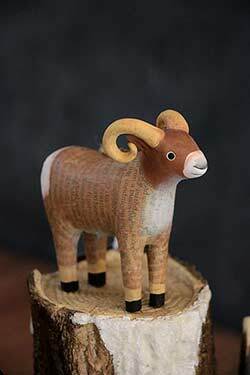 Recycled Paper Animal Ornament, by One Hundred 80 Degrees. Animal ornament made of resin and painted recycled paper. They all measure slightly different, but are on average about 4 inches. This is for the Wolf. Other animals also available! 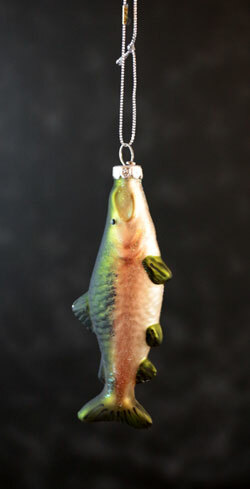 Resin Fishing Basket Ornament, by Seasons of Cannon Falls. Features a great catch of fish, reel, and basket. Measures 2 x 1.5 x 1.25 inches. Made of resin. Stuffed mini figure in a nordic-like red, white, and black color palette. Sanded base so it will sit on it's own, but has a string for hanging as an ornament. 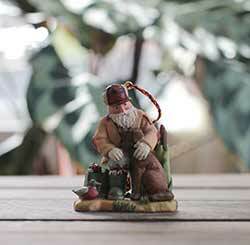 Stuffed mini figure in a woody brown and white color palette, with faux fir trim. Sanded so it will sit on it's own, but has a string for hanging as an ornament. 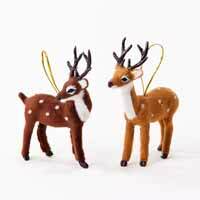 Soft Deer Ornament, by One Hundred 80 Degrees. 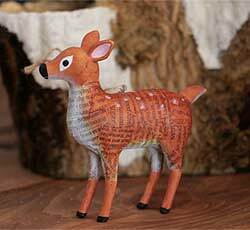 Sweet, soft, fuzzy fabric deer ornament. 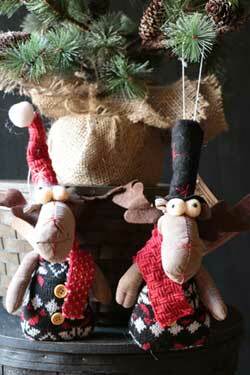 Sold individually (priced per ornament) - Choose the Light or Dark Brown Ornament. Measures 4 inches. This moose ornament is the perfect gift to commemorate a woodland vacation or cabin retreat, or as an decoration on a lodge themed tree! 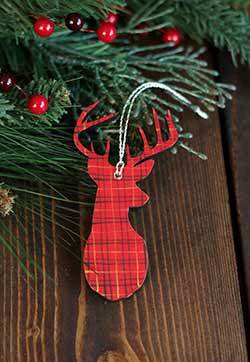 Gorgeous on a holiday tree, wine bottle, or gift package, this iconic stag head is freehand painted with a red tartan plaid. Twig Snowflake Ornament, by Seasons of Cannon Falls. Natural wood twig snowflakes covered in super-sparkly glitter. 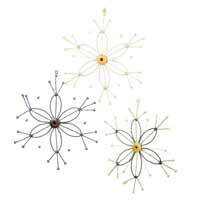 Sold individually from the four in photo - Choose (clockwise from top right) the Gold, Red, Light Brown, or Dark Brown Snowflake. Part of the Winter Pine Collection. Measures 7 x 1.25 x 8 inches. Made of wood. Winter Hat Ornament, by Hanna's Handiworks. Made of knit yarn in greys and browns, with faux fur trim. Measures 4 x 9 inches. Wire Wrapped Snowflake Ornament, by One Hundred 80 Degrees. Yarn-wrapped wire snowflake in neutral colors, accented with a button. Sold individually (priced per ornament) - Choose the Grey (left), Ivory (middle), or Green (right) Ornament. Measures 8.5 inches in diameter.